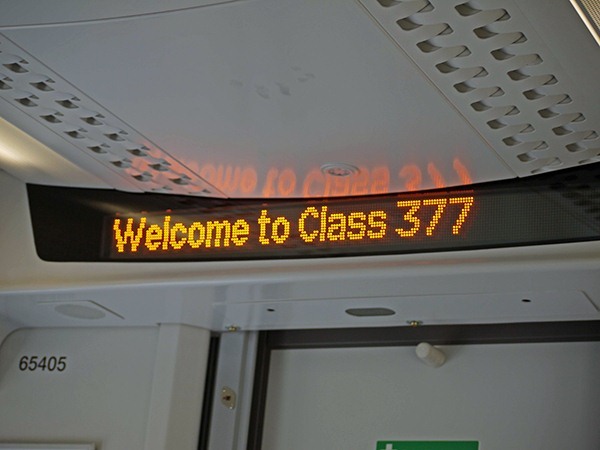 The first 377/7, 377704, entered service on Monday 16th June coupled to a 377/6 on a 377/6 diagram. 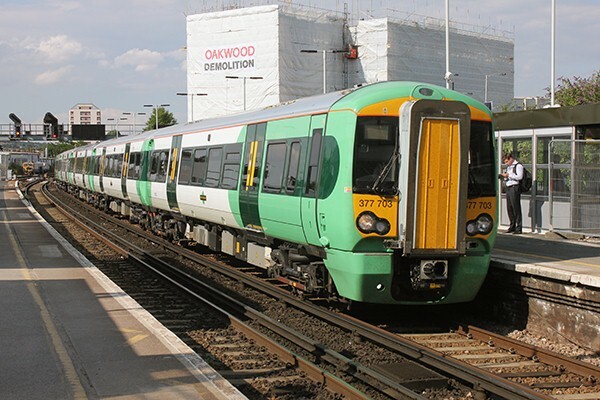 This unit is seen here two days later at Clapham Junction whilst working the 18:32 Victoria to Epsom Downs service. 377607 is leading. 377703 entered passenger service on Tuesday 17th June. 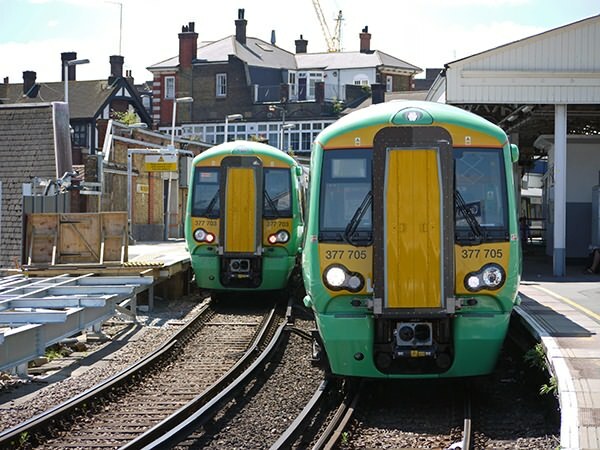 Following the satisfactory testing of the platform lengthening work at Watford is tested 377703 and 377704 commenced East Croydon - Milton Keynes workings on Monday 23rd June. 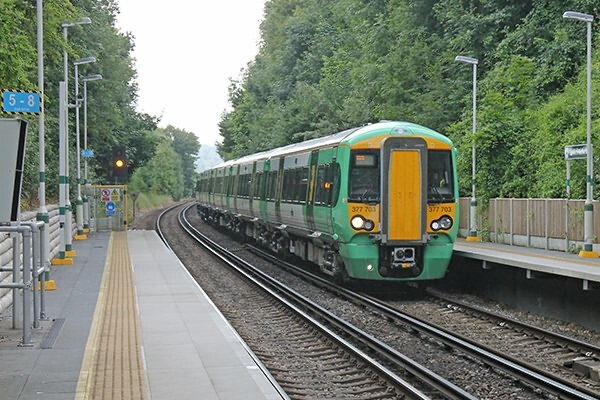 This released two 377/2 units with 377208 and 377214 transfering to First Capital Connect services on Saturday 21st June, going into the pool of 377/5 workings. 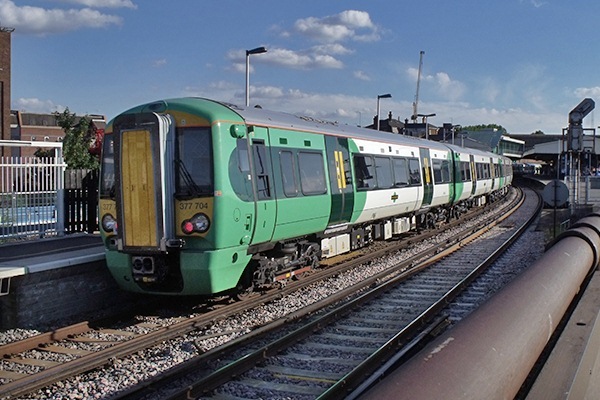 When not required for East Croydon to Milton Keynes services 377/7s work on 377/6 diagrams. 377703 is seen at Box Hill and Westhumble on 21st June whilst working the 11:57 Dorking to Victoria service. 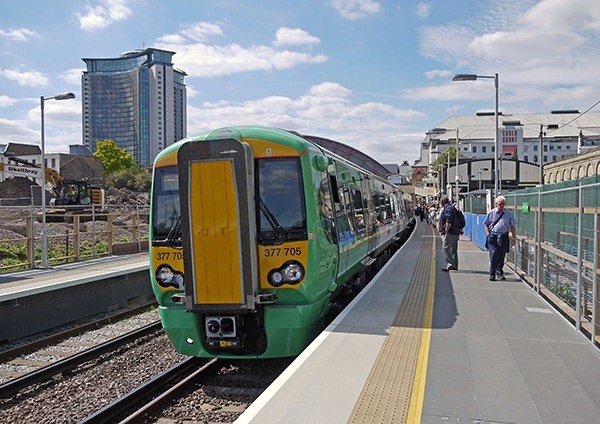 703 back on its dual voltage commitment, at East Croydon on 1st July prior to working to Milton Keynes Central. Dual voltage workings crossing in the tightly curved West London platforms at Clapham Junction on Bastille Day, 14th July 2014. 703 is working to East Croydon whilst 705 is preparing to depart for Milton Keynes Central. A bit further up the line 377705 pauses at West Brompton. At the time of Dr. Jeffs' journey north the PIS was not programmed to work when off the Southern Region! 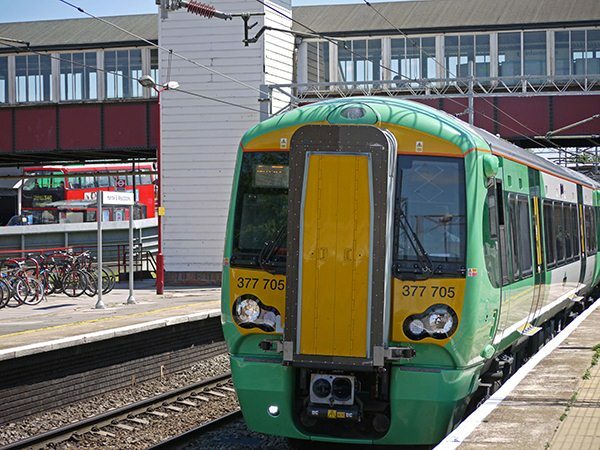 Now working on 25kV alternating current, 377705 calls at Harrow and Wealdstone on 14th July 2014. With the full 377/7 fleet in service 377209, 210, 213 & 215 have also been released to Thameslink workings, running in unbranded green livery.